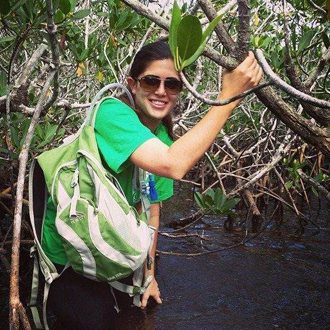 As a senior in College majoring in Environmental Studies, I discovered a passion for nature and helping others. Working for the School of Environment, Arts & Society at FIU opened many doors for me and has taught me that volunteering and getting involved is essential. In 2012 and 2013 I had the honor to be an intern for Changing Seas at WPBT2. Helping the crew has taught me so much about our beautiful oceans and how we should protect and value them. This internship has been a great opportunity for me to learn a new and different way of communicating the importance of a healthy environment to others. My job at FIU and my internship with Changing Seas have given me a new direction in my career, which is protecting nature and educating others about its importance. In the fall of 2013, Daniela will be joining the Peace Corps to put her skills to good use in Paraguay.